DJ Joshua Ryan moonlights as a serious business and tech journalist. Or maybe it's the other way around. Either way, he's successful at both and has a Wikipedia page to prove it. 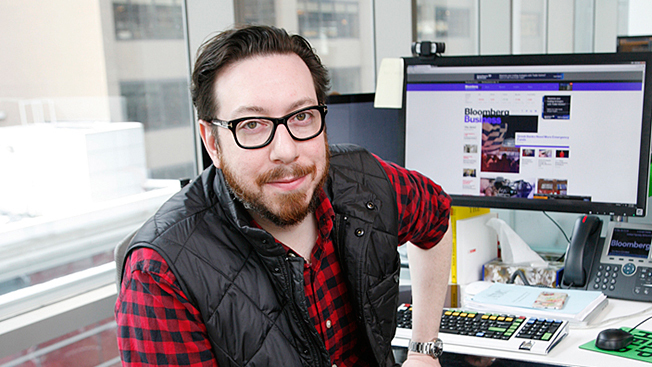 Previously EIC of Engadget, Joshua Topolsky co-founded popular tech news site The Verge in 2011. He left to join Bloomberg as editor of Bloomberg Digital in late 2014 where he recently launched Bloomberg Business, leading a team in designing, crafting and launching the news vertical. "It's a new era at Bloomberg," he said, "where all of the sides of the news business are really deeply connected—we're just getting started, but it's clear the new way of doing things is having an immediate and positive impact." While it may be a new era for editorial at the media giant, Bloomberg's notorious, uniform bullpen-style workspace with the firm's standard issue financial markets data terminal doesn't leave much room for creative expression in office decor. But that doesn't stop Topolsky from making his small station uniquely his. He even let us take a look. ”I’m actually using an older generation of the keyboard, which I think is totally awesome looking,” Topolsky said of his Bloomberg terminal. “Sometimes it’s actually easier to do Web design by using traditional techniques like cutting and pasting,” he noted. A Bloomberg colleague dropped off a note and vodka (Topolsky’s favorite) after the launch.